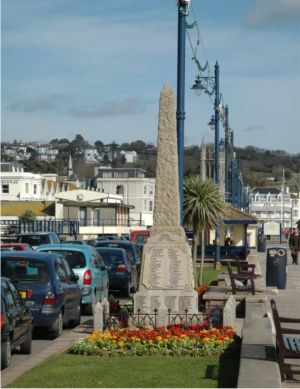 After World War I, Teignmouth Council were very grudging in the amount of land they were prepared to allocate for this Memorial - hence this crowded scene. It was decided to include in a single list the names of all local military and civilian casualties of the 1939 - 1945 when the names were added. 1666864 Sergeant (Flight Engineer) Jack Bidwell of the RAF Volunteer reserve. Son of Thomas and Emma Bidwell (née Tallet); husband of Frances May Bidwell (née Howard) of Wokingham. Born in Wandsworth in the September Quarter of 1904. Died 18 November 1944 aged 40. 14426839 Signalman Cecil Max Blewett of the Royal Corps of Signals. Son of Edgar Bertram and Dorothy Mildred Blewett (née Manhire). Born in St Austell in the March Quarter of 1925. Died 19 July 1943 aged 18. Buried in Teignmouth Cemetery. LT/JX 173500 Seaman Frederick Charles Boyne of the Royal Navy Patrol Service, HM Trawler Gregory. Son of Charles Alfred and Emma Elizabeth Boyne (née Baker) of Teignmouth; husband of Kate Elizabeth Boyne (née Dodd) of Teignmouth. Born in Teignmouth 26 February 1900. Died 25 November 1945 aged 45. Buried in Teignmouth Cemetery. D/MX 72686 Ordnance Artificer 5th Class Peter P Boyne of the Royal Navy, HMS Repulse. Son of Albert and Hilda Boyne (née Pine). Born in Teignmouth in the September Quarter of 1921. Died 10 December 1941 aged 20. 2661276 Guardsman Charles Ronald brewer of the 5th Battalion, the Coldstream Guards. Son of Charles and Emily Brewer (née Stocker) of Teignmouth. Born in Teignmouth in the June Quarter of 1920. Died 16 February 1945 aged 24. D/K 13632 Petty Officer Supply William Samuel Broom of the Royal Navy, HMS Hermes. Son of John H and Mary Broom. Born in Teignmouth 11 December 1893. Died 9 April 1941 aged 48. 5628364 Lance Corporal Jack Sidney Carter of "Z" Advanced Ordnance Workshop, the Royal Army Ordnance Corps. Son of Sidney A and Dorothy Carter (née Bagley) of Teignmouth. Born in Teignmouth in the June Quarter of 1922. Died 14 February 1942 aged 19. Lieutenant Commander Peter Norton Churchill of the Royal Navy, HMS Gloucester. Son of Lt.-Col. Arthur Norton Churchill and Marion Churchill (née Foster); husband of Nancy Trevelyan Churchill of Teignmouth. Born in Tonbridge in the December Quarter of 1903. Died 8 July 1940 aged 36. D/JX 284817 Able Seaman Lionel Cosway of the Royal Navy. Son of Albert Edward and Ann Luxton Cosway (née Tancock). Born in Teignmouth in the June Quarter of 1922. Died 12 August 1944 aged 22. Buried in Teignmouth Cemetery. D/M Chief Ordnance Artificer Michael James Wilfred Day of the Royal Navy, HMS Gloucester. Husband of Joyce Vera Day (née Court) of Teignmouth. Born in Pilgwently, Newport, 19 April 1897. Died 22 May 1941 aged 44. PLY/X 2424 Marine John William Stephen Derges of the Royal Marines, HMS Glorious. Son of William john and Emily Derges (née Gigg) of Teignmouth. Born in Honiton in the September Quarter of 1920. Died 8 June 1940 aged 19. 41095 Major Richard Grenville Arthur Duxbury of the Royal Artillery, attached to the Royal Indian Army and the 8th (Sikh) Light Ack Ack Regiment. Son of the Rev. George Richard Duxbury MA and Amy Louisa Duxbury . Died 14 May 1944 aged 36. 5664606 Sergeant Gerald Henry Edworthy of the RAF, 46 Squadron. Son of Harry and Edith Mary Edworthy (née Bartlett) of Teignmouth. Born in Teignmouth in the March Quarter of 1915. Died 3 September 1940 aged 25. S/5504180 Private Richard John Fielden of the Royal Army Service Corps. Died 28 December 1943 aged 26. Leonard Hamlyn died during the Plymouth Blitz and is remembered on the Plymouth Casualty list. D/J 72661 Able Seaman John William Heslop of the Royal Navy, HMS Glorious. Husband of Florence Gwendoline Heslop (née Drew) formerly of Teignmouth. Born in Chester-le-Street, Durham 1 January 1902. Died 8 June 1940 aged 38. D/M 36163 Chief Engine Room Artificer Cyril Percival Hill of the Royal Navy, HMS Drake. Son of Felix William and Anne Lena Hill (née Crocker); husband of Lilian Hilda Hill (née Bryant) of Teignmouth. Born in Plymouth in the September Quarter of 1905. Died 10 march 1945 aged 39. Buried in Teignmouth Cemetery. D/JX Able Seaman Ernest George Hook of the Royal Navy, HMS Stanley. Son of William E and Kate Hook ( née Rogers); husband of Norah D E Hook (née Hooper) of Teignmouth. Born in Teignmouth in the December Quarter of 1906. Died 19 December 1941 aged 33. 921975 Sergeant (pilot) Allen Wakley Hughes of the RAF Volunteer Reserve, 166 Squadron. Son of Frederick Allen and Alice Hughes (née Wakley) of Teignmouth. Born in Malmesbury, Wilts, in the June Quarter of 1914. Died 31 March 1944 aged 30. 5629315 Private Cecil Edward Hurford of the 1st Battalion, the Devonshire Regiment. Husband of Ivy A Hurford (née Pickles) of Teignmouth. Born in Richmond, Surrey, in the March Quarter of 1911. Died 23 March 1945 aged 34. LT/JX 222378 Ordinary Seaman Mervyn Waldron Johnson of the Royal Naval Patrol Service, HMS Europa. Son of Albert Edward and Alice Johnson (née Medland) of Teignmouth; husband of Rose Edith Johnson (née Cull) of Higher Blagdon, nr. Paignton. Born in Dawlish in the June Quarter of 1906. Died 16 October 1940 aged 34. Buried in Teignmouth Cemetery. 5630609 Private Percival Roy Johnson of the 4th Battalion, the Devonshire Regiment. Son of Arthur John and Hannah Alice Johnson (née Stocker) of Teignmouth. Born in Teignmouth in the June Quarter of 1913. Died 20 July 1943 aged 30. 5619142 Private Edward George Lane of the 7th Battalion, the Devonshire Regiment. Son of John Henry and Lilian Maud Lane. Died 2 July 1940 aged 21. Able Seaman Ernest Thirwell Maddison of the Merchant Navy, MV Ngaroma. Son of Thomas and Ann Thirwell (née Wardle); husband of Daisy Bertha Maddison (née Elson) of Teignmouth. Born in Gateshead in the March Quarter of 1900. Died 30 May 1940 aged 40. 187506 Sapper Marcus John Downes McCausland of 39 Fortress Company, the Royal Engineers. Son of Cecil Frank and Julia Moncia McCausland of Teignmouth. Died 17 June 1940 aged 25. 49832 Flying Officer Leslie John McCullock of the Royal Air Force, 502 Squadron. Son of John and Elizabeth Sybil McCullock (née Griffiths) of Teignmouth; husband of Bronwen McCullock (née Morgan) of Teignmouth. Born in Teignmouth in the June Quarter of 1918. Died 22 March 1943 aged 25. Lieut. Commander William Brabazon Robert Morrison of the Royal Navy, HMS Janus. Son of Brigadier Joseph Morrison and Magdalen Ethel Irene Morrison; husband of Barbara Morrison (née Lees) of Teignmouth. Died 23 January 1944 aged 33. Volunteer Home Guard. Russell P E. Mullen of the 13th Gloucestershire (City of Bristol) Regiment. Son of Joseph Thomas and Mabel Ellen Mullen of Teignmouth; husband of Marion Elizabeth Mullen (née Gilpin) of Dawlish. Born in Teignmouth in the September Quarter of 1912. Died 25 September 1940 aged 27. D/JX 144199 Leading Seaman Edward Henry Roff Parkin of the Royal Navy, HMS Illustrious. Son of Florence May M Parkin (née Roff) of Teignmouth. Born in Teignmouth in the March Quarter of 1920. Died 10 January 1941 aged 21. 1564951 Gunner Arthur William Passmore of 180 Battery, 60 Light Ack Ack Regiment, the Royal Artillery. Son of Thomas Austin and Alice Louise Passmore (née Dyer) of Teignmouth. Born in Teignmouth in the June Quarter of 1914. Died 26 March 1945 aged 30. 580454 Sergeant (Observer) Richard Cecil Luscombe Pike of the RAF, 218 Squadron. Son of the late Cecil T B and Mildred Ethel Pike (née Luscombe) of Higher Brimley, Teignmouth. Born in Plympton in the September Quarter of 1915. Died 13 November 1939 aged 24. Flight Lieutenant (Pilot) Victor Fernley Baker of the RAF , 7 Squadron. Son of the late Cecil T B and Mildred Ethel Pike (née Luscombe) of Higher Brimley, Teignmouth. Born in Plymouth in the June Quarter of 1919. Died 9 April 1941 aged 20. Awarded the DFC. D/K 8436 Petty Officer Stoker Ernest William Robins of the Royal Navy, HMS Drake. Son of William Richard and Caroline Robins (née Bryett), husband of Susan Annie Robins of Teignmouth. Born in Stonehouse, Plymouth 10 May 1891. Died 24 April 1941 aged 49. Buried in Teignmouth Cemetery. 147669 Flying Oggicer (Navigator) William Herbert Rogers of the RAF Volunteer Reserve, 23 Squadron. Son of William Morrott and Ellen Elizabeth Rogers. Born in Teignmouth in the June Quarter of 1920. Died 6 February 1944 aged 23. Captain Alan Francis Salt of the 1st Regiment, the Royal Horse Artillery. Son of Edwin Henry Francis and Phillipa Maud Salt (née Tucker). Born in Richmond, Surrey, in the December Quarter of 1916, Died 29 November 1941 aged 25. Mentioned in Despatches. WX115 Private Charles Edward Shapland of 2/11 Battalion, the 76th Australian Infantry. Son of Charles and Matilda Shapland (née Smith) of Teignmouth. Died 29 July 1944 aged 31. 56709 Sergeant Ernest Short of the RAF, 35 Squadron, Son of Sam Perkins Short and Maud Florence Janet Short (née McCleod) of Teignmouth. Born in Teignmouth in the June Quarter of 1918.Diewd 26 July 1941 aged 23. Mentioned in Despatches. 5619050 Private William John Stoneman of the 2nd Battalion, the Northants Regiment. Son of Frederick and Lily E Stoneman (née Fishley) of Coombe, Teignmouth. 14415673 Trooper Jack Francis Stanbury of the 10th Royal Hussars Royal Armoured Corps. Son of Leslie and Meta Stanbury of Teignmouth. Born in Teignmouth in the December Quarter of 1923. Died 8 July 1944 aged 20. Buried in Teignmouth Cemetery. RMB/X 269 Musician Charley John Hutchins Sullivan of the Royal Marine Band of HMS Trinidad LINK. Son of Dennis and Hannah E Sullivan; husband of Evelyn Sullivan (née Newell) of Teignmouth. 847064 Gunner Francis Anderson George Thorne of the 3rd Field Regiment, the Royal Artillery. Son of George and Helena Mabel Thorne of Teignmouth; brother of John (see below). Died 17 June 1942 aged 22. 872122 Bombardier John Humphrey W Thorne of the 1st Regiment, the Royal Horse Artillery. Son of George and Helena Mabel Thorne (née Humphrey) of Teignmouth; brother of Francis (see above). Died 1 December 1947 aged 23. D/JX 285129 Able Seaman Harold Anisley Tidball of the Royal Navy, HMS Lapwing. Son of Frank and Edith Tidball (née Sage); husband of Annie Mary Tidball (née Stride) of Shaldon. Born in Shaldon in the December Quarter of 1920. Died 20 March 1945 aged 24. 7519055 Sergeant George Stephen Tusler of the Corps of Military Police. Son of William and Mary Jane Tusler (née Hammacott); husband of Eva Tusler (née Moore). Born in Teignmouth in the June Quarter of 1907. Died 12 April 1942 aged 35. Buried in Teignmouth Cemetery. Lieutenant Commander Francis Underhill of the Royal Navy, HMS Lucifer. Son of George and Charlotte Underhill of Teignmouth; husband of Ethel Mary Underhill of Teignmouth. Born in Teignmouth in the December Quarter of 1883. Died 29 January 1942 aged 59. Buried in Teignmouth Cemetery. 5628724 Private Edward Ellis Walling of the 1st Battalion, the Devonshire Regiment. Born in Worcester in the December Quarter of 1912. Died 7 July 1944 aged 31. 52938 Flying Officer Ralph Taverham Ware of the RAF. Son of Sidney Harold and Alice Jane Ware (née Carter). Born in West Ham in the September Quarter of 1914. Died 21 January 1945 in a crash off the Scilly Isles due to icing, aged 30. Mentioned in Despatches. D/JX138703 Able Seaman Cyril Gordon Westlake of the Royal Navy, HMS Hunter. Son of William James and Frances Elsie Westlake (née Knight). Born in Teignmouth in the March Quarter of 1917. Died 10 April 1940 aged 23. Lieutenant Colonel Ernest Victor Whitehead, commanding the 3rd Battalion, the 8th Gurkha Rifles. Son of Major Ernest Kilve and Edith Henrietta Whitehead; husband of Felicity Pelham Whitehead, formerly of Cullompton; brother of Henry (see below). Born in 1908. Died 1 March 1945 aged 37. Awarded the DSO and twice Mentioned in Despatches. Major Stanley Henry James Whitehead of the 3rd Battalion, the 18th Royal Garhwal Rifles*. Son of Major Ernest Kilve and Edith Henrietta Whitehead; husband of Pamela Mary Whitehead; brother of Ernest (see above). Born in India in 1911 and had Indian nationality. Died 8 August 1944 aged 33. *A Gurkha Regiment which fought with distinction in World War 2. 258600 Signalman Eric Norman Whitlock of the Royal Corps of Signals. Son of Ernest and Dorothy Whitlock. Born in Teignmouth in the March Quarter of 1921. Died 9 December 1947 aged 26. P/JX 514690 Ordinary Seaman William Albert Williams of the Royal Navy, HMS Lagan. Son of Albert and Mary Jane Williams (née Stacey) of Teignmouth. Born in Torrington in the September Quarter of 1925. Died 20 September 1943 aged 18. Lieutenant Norman Charles Wills of the Royal Navy, HMS Daedalus*; served with the Fleet Air Arm 815 Squadron. Died as a result of an air crash 17 February 1944. Commemorated on the Memorial at Lee-on-Solent. Awarded the DSM. *A Naval air base at Lee on Solent. Not yet confirmed but this may refer to Charlie Wood, who was adopted as a child by a couple who lived in Shaldon. 1585640 Flight Sergeant (Wireless Operator/Air Gunner) Charles Kingsley Johns of the RAF, 179 Squadron. Son of F Lake Johns and E Johns (née Kingsley) of Teignmouth. Born in Teignmouth in the September Quarter of 1924. Died 31 December 1944 aged 20.